If you're a one person team or you just need a video presentation done yesterday a tool like Render Forest can be a real time saver. 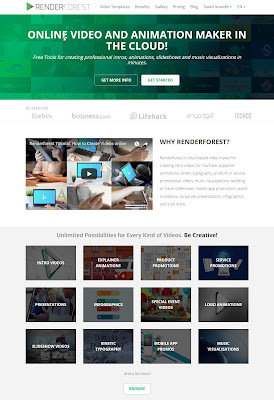 Render Forest is a free, cloud based intros, animations, slideshows and music visualizations creator. They provide professionally designed templates to which you just insert your text, photos and videos, add licensed music (that doesn't sound awful) and your video is done. Free videos are watermarked. If you want to remove this you can purchase your video, in your choice of resolutions, at very reasonable price points, or you can purchase an annual subscription to have them removed on all videos. At this point I've only used Render Forest to create slide show style presentations, so this review is limited to that experience (and this is not a paid review), however there is so much more you can do. 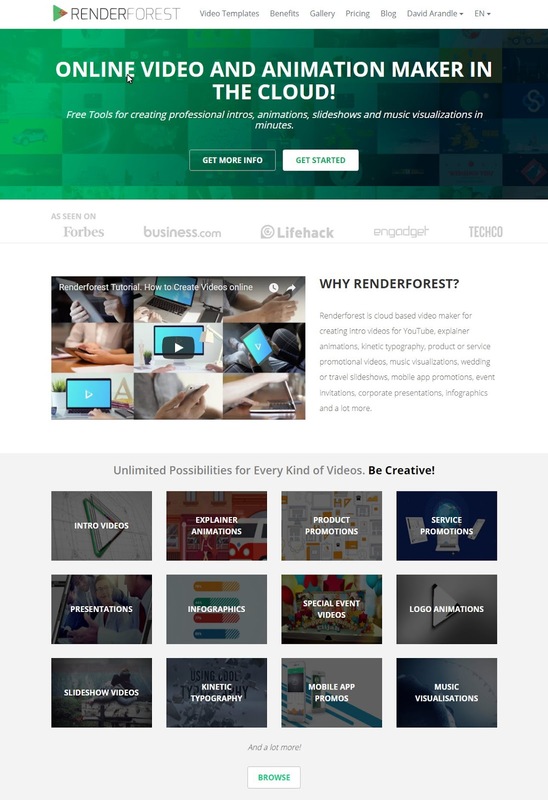 Check out Render Forest's video below for a complete overview of the possibilities. I wanted to create a dynamic slide show presentation of my 31 InkTober artworks, displayed in under a minute, to promote my website. Starting the process by searching for a suitable template. Render Forest's library of templates, for almost every situation, is extremely impressive. I like to think I know my way around a video editor but most of their templates easily have hours (probably even days) of work in them to be at such a professional standard. It would take me days to custom design and edit my videos to this standard. Hence the time saving aspect. Also, even if the content you add is the most bland, boring information you can imagine, these templates are going to lift your presentation up and make it seem inspirational (that may be over selling it but I haven't found a template yet that didn't look great). The video editor is easy to use. Everything is clearly marked for where your content needs to go. You can upload images individually from your computer into the project, or you can bulk load your content into your media library first, before adding individual items to your project. Either way, everything is saved to your media library for quick access later if you want to move things around - no need to re-upload anything. Storage space for your media library is based upon your subscription level. Free accounts have 500MB, which is good for slide shows. If your projects are more video footage heavy you may want to consider upgrading. A nice feature is that you can sort your media library into folders allowing you to keep content for each project separate. I did have a brief look at the editor for more complex projects such as 'broadcast video' where you are presented with many more options and flexibility. Everything from logo intros, lower third text overlays, to social media outros and more, as well as access to stock images and video footage too. For slide shows, once you've added your content into the template, you then choose a color palette (which for my project was limited to changing the background color). From there, select a suitable music track that fits the length of the presentation. The range of music is really good, in many styles, moods and genres. One issue you will have is, if you're uploading your finished video to YouTube, you may get hit with a copyrighted music claim relatively quickly. Your video won't be blocked and you won't receive any strikes but ads from the license holder may appear with your video. If you have purchased your video, Render Forest's Technical Support FAQ's tells you how to get copyright claims removed without having to submit a YouTube dispute ticket. It's an easy process, with the claim being removed within hours. Once you've added your music, you're done. Videos can be published directly to Facebook or YouTube, or you can download them at your choice of resolution depending on your needs. As I said above, if yo don't want your videos to be watermarked, you can purchase the video to have this removed. Watch the slide show video I created below which only took me an hour or so to create - including making my own social media link images to fill in the template image spaces toward the end. Overall I'm very impressed with what Render Forest can do, particularly in terms of time saving and raising the production quality of my videos. I'm seriously considering using them for more advanced productions like video blogs to give my presentations a more professional feel. Given that the service is entirely free to get started, it's well worth checking out. It may be an easy way to lift your videos to the next level. I just landed on your blog when I was searching for animation help and video making projects. Thank you very much for that awesome recommendation.